Providing you the best range of dressing frame set ( consist of four frames), tweezer dexterity test (for eye-hand coordination), foot placement ladder, counting &amp; colour sorting beads set (4 rods &amp; 32 beads), basic balance beam and geometric shape form board set with effective & timely delivery. 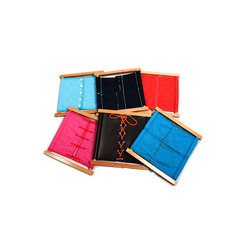 Required for giving training aid and teaching basic use of clothing faster, Dressing Frame Set (Consist Of Four Frames) is the best tool. 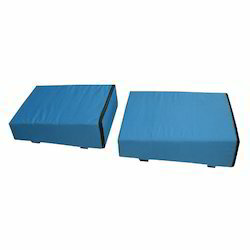 It is basically used in rehabilitation department for eye-to-hand coordination and learning common dressing sense. The training includes large button use, bow tying, hooks, compression snaps, small buttons, zippers, lacing and belt buckling. Tweezer Dexterity Test (For Eye-Hand Coordination) is designed to evaluate the manual abilities of a learner to offer appropriate therapy. The design of the device includes use of tweezer to insert pins into each hole of board. With this precise small tool, the principle behind using this is to check eye-hand coordination. Foot Placement Ladder is an innovative model, which is designed to be used in various therapy regarding mobility or balance disabilities. This comprises of adjustable cross bars at different length steps. Along this, it also comprises of metal crossties. The patient can walk between the cross bars, meant for developing the concept of weight transference varying from right to left foot. Relying on the expertise of our team, we present a range of Counting And Colour Sorting Beads Set (4 Rods & 32 Beads). It comprises of colourful beads and rods required for manipulative counting, Colour recognition and eye-hand coordination. The box contains 4 rods and 32 beads of different colours, while the rods will get fix into lid. 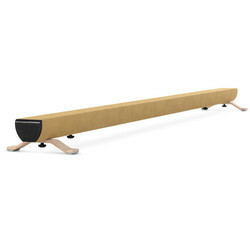 Ergonomically designed, Basic Balance Beam is used as gymnast’s apparatus to perform in many athletic events. This is basically designed to be raised from the floor on a leg or stand at both ends. Plain polished wood is used for its designing that is of premium quality. Due to its unmatched qualities, this consists of mixture of acrobatic skills, poses, dance elements and leaps. Giving the introduction regarding Geometric Shape Form Board Set, it is a kind of learning thing need for perception. 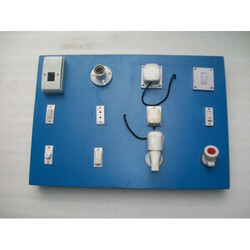 This board is used basically for colour identification, eye-to-hand coordination and other learning process. It is bring in use when practice of intensive form perception is done. 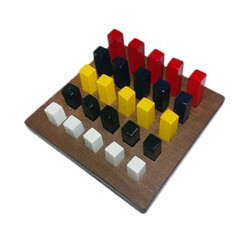 The board is available in various attractive geometric shapes and colours. Peg Board Multi shape LCS 403 is a fun activity that is required for improving the motor skills and coordination among the children. With the help of this device the children can develop body awareness, mental stability and balance skills. 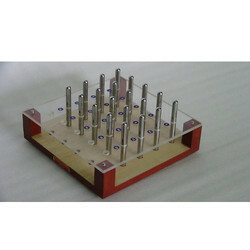 It is a wooden laminated board with square slots for insertion of square pegs. Our organization is a leading manufacturer of Sanding Unit Overhead (With Stand), used as occupational therapy aid. This is defined as heavy and wide based stand that can be adjustable according to height. The unit is equipped with semi circulatory wooden plank that offer support. Patient can move sanding block to enhance rom of shoulder. Designed to get fit on a table, Sanding Unit Semicircular (Table Model) is manufactured using hard wood. It easily gets mounted on table along with roller that offers bilateral resistive exercises. These rollers are covered with felt to offer resistance. Our team uses factory tested components for the manufacturing process and is checked on the basis of quality parameters. Designed for measuring the basic level of functioning of an individual, Peg Board Round LCS 401 is used in the area of color identification, shapes and size identification. It is comprised of wooden laminated board having round slots for peg insertion. This is available in 5 different colours. 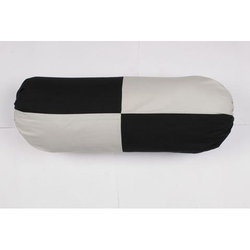 Bolster Set of 4 is designed as a long narrow pillow or cushion. With the help of this, it becomes easy to give therapy to various patients when they need support. Thus, used for various medical, therapeutic and comfort applications, this product has become perfect solution to relive stress and pain. Electro Equipment Frame Set is precisely designed, which consists of three different kinds of switches, toggle, piano and turn button. Along with this it also comprises of three pilot coloured bulbs and push button switch. The push button is wired with call bell that can be operated on optimum power. The design of Equilibrium Board (Rectangular) persuaded to maintain rhythm, balance, vestibular responses and coordination among children. Beside this, children will get confidence for maintaining kneeling and standing position. The board is equipped with recessed sides, offering hold of hand avoiding pinched fingers. 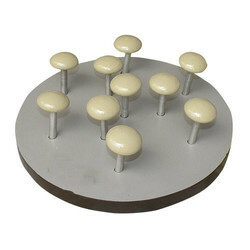 Mushroom Board (10 Pegs & 10 Tops) is a round shaped board having variant holes with a step to hold tops. Both tops and pegs are painted in different colours for easy identifications. Premium grade components are used for manufacturing purposes that are factory tested. Various quality parameters are done on this unit to check the durability and reliability. 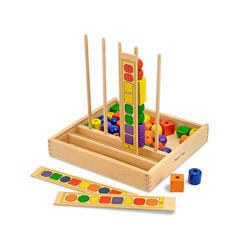 Peg Board Five (25 Pegs) is designed to measure the mental level functioning. The therapist and patient used this unit in colour identification/grouping. In addition to this, this has been used to check movement of fingers, hand and arms. There are total of 25 holes in the board in 5 x 5 rows to hold smoothly finished plastic pegs. Thus, it is used for eye-to-hand coordination, visual perception and motor coordination with the assistance of pegs and cylinders. 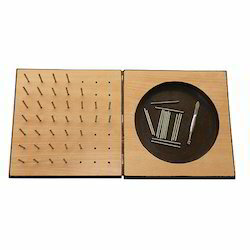 Especially designed to measure an individual’s basic level of functioning, Peg Board Ten (100 Pegs) is appreciated for its multipurpose functioning. The board is used in area of colour identification, movement of arms, fingers and hands. 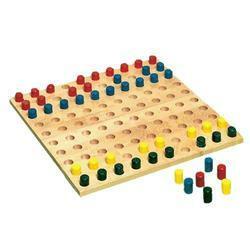 The board has 100 holes, 10 in a line in which the pegs are fitted. Engrossed with bright laminated six wooden discs and six metal rings, Supinator & Pronator (Zig-Zag Type) is required for occupational therapy. The premium grade materials are used for the manufacturing processes. Various quality parameters are done on this equipment to check the performance and obtain flawless product. With the design of pegboard, Depth Perception Peg Board Set is required for promoting depth perception and eye-hand coordination. Furthermore, it can also bring in use to develop the subjects’ capacity for manual dexterity. 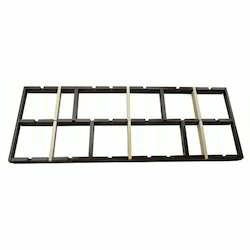 The top level of this pegboard is smooth and clear while the bottom side is made up of wood. 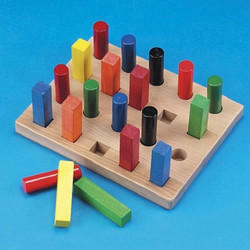 The graded construction of Peg Board Graded Square (25 Pegs) is designed for stimulating and depth perception. 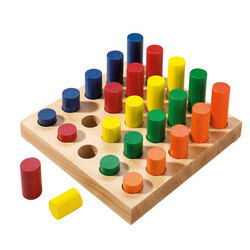 Whether it is about basic level of function or field of colours, this device is used for learning purposes. Our customers can avail this in various shapes and sizes, meeting national as well as international standards. 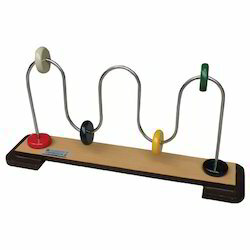 Being the most advanced technique in the field of occupational therapy, Key Hole Test Board is intelligently brought in use. The main design encloses hinged box with randomly positioned key-hole having 25 slots and same number of pegs. For easy learning purposes, the patient must insert the metal pegs into holes and insure proper fit. Ideal for offering extra large support surface, Vestibular Board (Large) is good for doing balancing exercises. With its use, the vestibular training gets easier and safer for both therapist and patients. The wide surface offer great range of balance positions that allow the user to simply rock their body position on the board. 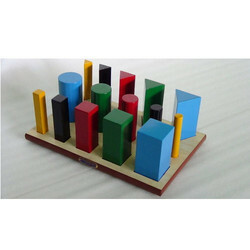 Peg Board Multi Shaped (5 Round & 5 Square) is used to measure the basic level of functioning. This unit is basically used in area of colour identification, shapes and sizes. The shapes those are available is round and square in different sizes and shapes. A series of quality tests are done on this in order to get sound board for learning purposes. The main purpose of using Door-Latch Frame Set is to offer learning opportunity and progressive developments. It is engrossed with six laminated doors that get opened in different directions. Each of the door contain two hinges and thus, used in home to familiarized patient. Our offered range is available in various shapes, sizes and designs meeting the expectation of our customers. Required for self care and play activities, Size Perception Round Board Set is used widely in occupational therapy. The board is used for perception of size without any factor of shape. It helps in developing the size consistency concept and sequential placement of increasing size. 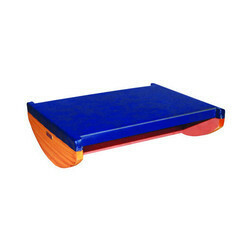 Vestibular therapy now becomes easy with the use of Vestibular Board (Large Foldable). It helps the pediatrics while performing balance exercises in various conditions and disorders. 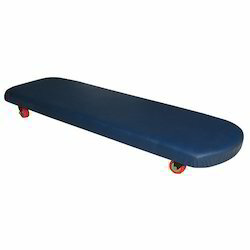 Beside this, the board also assists in strengthening children’s muscles. In addition to this, therapist and patients can use it for play therapy along with practice of walking and crawling. 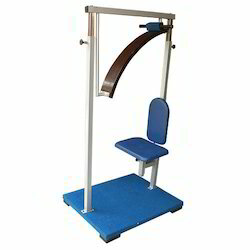 Equipped with wooden hinged planks, Sanding Unit Vertical (With Wall Mounting) is required for various kinds of exercises. For angle adjustment, it gets fitted on an angular frame and is available with six weight plates. 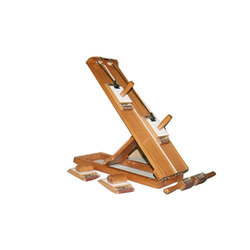 It is also equipped with one standing block to increase the strength. 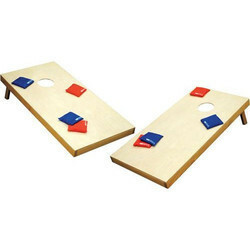 Wedge board is available in most versatile shape, required for gross-motor activities. These activities include rolling tumbling, walking up, downhill and lying down to read or study. It is best suited for osteopathy for purposes like muscle strengthening, toning, posture movement, balance, spinal therapy and others. Sanding Unit For Reciprocal Exercise (With Adjustable Incline) is designed with the wooden plank that is used in various purposes. 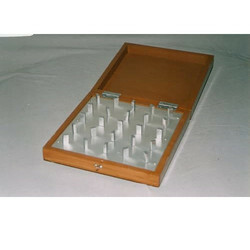 Different sets of sanding hand blocks are available with grasp holders for offering support. The position can be changed with upper plank’s angle of inclination. The sanding block is generally used for creating resistance to exercises. Hand Dynamometer + Pinch Gauge is worked as a medical devices meant for measuring person’s strength, output of power in muscles and force during contraction. Moreover, dynamometer is used for determining patient’s grip, arm and overall body strength. The testing is generally done when patient hardly squeezes the dynamometer and the result get recorded as well as compared for better performance. 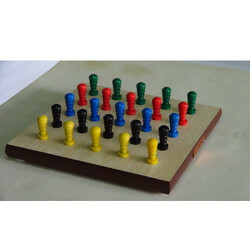 Peg Board Wall Mounting (10 Round & 10 Square) is an outcome of combination of manipulative experience and practice. This mathematical puzzle can engage the children for long hours. It assists the development of grasp strength and tolerance. The round and square peg helps to hold and place them easily. Each one of them is numbered and can be placed into holes to solve the puzzle. Size Perception Square Board Set is designed for performing various therapeutic uses of work, self care and play activities. This is required for body development and prevents disability to achieve maximum independence. Furthermore, the other use of this is perception of size without the factor shape. Slanted Walking Board is a unique board, designed for providing slanted surface need for walking. It corrects the walk of patients and offered good range of support. The slanted board can be adjusted to a certain slant from both inside to outside. Premium grade materials are used for the manufacturing purpose and are factory tested.